Tradition: The handing down of beliefs or customs from one generation to another, especially without writing." Few things have much tradition in this day and age of space exploration, social media, hybrid cars and smart phones. But ribs and chicken are still being traditionally slow cooked to perfection at Eustis' King’s Taste Bar-B-Que’s chicken and ribs. Eustis has been blessed with a barbecue that is so good, that it is still being cooked using the original method and secret sauce for over 50 years. “It’s the slow cooking and the secret sauce that makes it so good!” Kings is the original Pit BBQ that is cooked with a mustard based verse a tomato based sauce. That means that you can constantly marinate the ribs and chicken because the mustard doesn't burn. 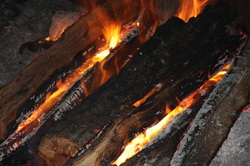 The first step in our process is to burn wood down to coals. 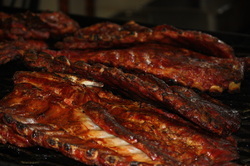 Our fresh ribs and chicken are seasoned and then placed on the racks over the hot coals. 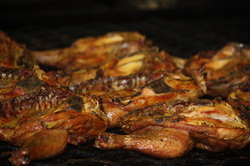 The chicken and ribs are delivered fresh each week (never frozen). We slow cook our ribs and chicken for 3-4 hours just turning enough to establish that golden bronze color that is created by the secret sauce. When comes to favor and taste chicken, nothing can beat Kings. 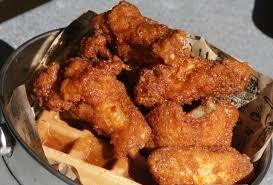 Cooked to a golden brown, sealing the favor and juice, you just can beat Kings Chicken. Another of Kings specialties is our jumbo spicy wings served with either mild or hot sauce or you can just eat them plain with our special seasoning. This is favorite of sport fans and the on the go business customers. Tell you want it "hot as Tucker for a real treat"